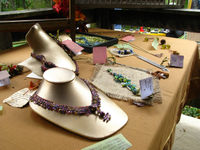 Our 2010 summer in Maine has started off with great weather, a Fourth of July lobster bake and exciting plans for a trunk showing of my jewelry in Wiscasset, Maine for July 22-23. Here's a link to the press release. I am very pleased to have completed Random Acts of Beads, a necklace five years in the making, shown in the press release (and above). 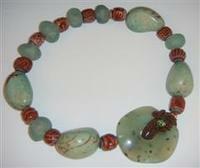 It is comprised of 18 separate beaded components which were then sewn onto a separate beaded necklace base. 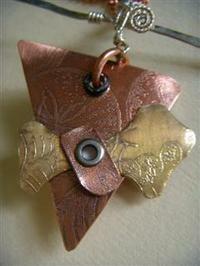 It's in shades of caramel and copper with purple accents and made to sit at the base of the neck for all to see. I have also been very busy making a half dozen unusual freshwater cultured pearl necklaces (above). They're unusual because of the pearl shapes and incredible iridescent colors. Shown are Jacks (they remind me of the Jacks game we used to play as kids), Merlot and Hummingbird. For the many lovers of purple, I made a seven-strand pearl bracelet that is definitely BLING. The custom two-inch dichroic glass and Sterling clasp is meant to be worn on the front of the wrist, the better to show it off, along with the 14 Swarovski crystal cubes alongside it. The last photo is NightBloom (above), one of two stunning (if I do say so) bracelets that really need to be seen in person. NightBloom features scores of beads: vintage, glass, stones and gems in black, gray, taupe, silver, copper, lavender and teal. The closure is handmade glass in black and white stripes by David Christianson of Providence, Rhode Island. The second bracelet (no photo) is in lime and turquoise with seahorses, shells and fish with an eye-catching ceramic toggle clasp. This is a happy bracelet. If you're anywhere in the midcoast Maine area on July 22-23, please stop by and see the trunk show as well as DebraElizabeth's wonderful shop, right on the banks of the Sheepscot River. Be sure to get in line for a lobster roll at world famous Red's Eats, right at the end of the block. Deb's phone # is 207 882 8485. If I don't see you there, be sure to mark October 16-17 on your calendar for the Great Falls Studio Tour. I'll be opening my studio once again for this event, which gets bigger and bigger each year. Wonderful fall weather ... 60 degrees, blue skies ... and lots and lots of people. Thanks to all of you who visited my displays at Laura's home in Great Falls. Don't forget, you can see more of my new work at the Great Falls Studio's Christmas Show at the Historic Colvin Run Dance Hall in Great Falls (Directions here.) It's Dec. 13th and 14th. I've been busy!!!! Come see! 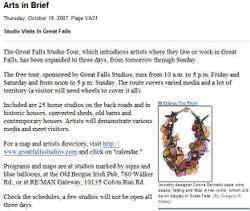 Come to the 5th annual Great Falls Studios Tour. I will be exhibiting and demonstrating at 438 River Bend Road. (Google Maps link here.) 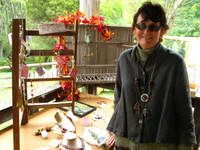 It is the home of Pig Pen Pottery and Laura Nichols, President of Great Falls Studios. There is lots of parking. The setting is absolutely bucolic: a winding country lane, a one-lane bridge, hills and dales, the way Great Falls used to be! You will be able to see the work of a wonderful water colorist, Linda Jones, as well as the functional and decorative pottery of Laura. Weather permitting, Laura will be firing Raku in her outdoor kiln. A color Studio Tour brochure with map to all the venues and with a description and picture of each artist's work is available at Great Falls Hardware, at the Library and many other downtown locations. Many artists have "doubled up" as I have so that you will be able to see a variety of art, skills and talents at each location. I'd be happy to mail you one if you email me. WOW! Almost spit out my morning coffee when we heard about this ... in the Washington Post this morning. A beautiful promotional article about this weekend's Great Falls Studio Tour as well as ... ta da!!!! 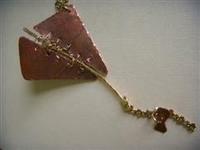 ... a picture of my "Carnival" necklace. After three and a half glorious months in Maine this summer, we are now back home in Virginia and in the full swing of the season. 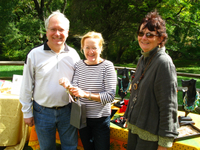 Our Great Falls Studios Artists Tour will be the weekend of October 19, 20, 21 (10-5 p.m. Friday and Saturday, noon to 5 p.m. on Sunday). And this weekend 10 of our group will be demonstrating on the Village Green at The Taste of Great Falls (noon-4). This past Friday and Monday, October 5 and 8, I had two great classes at Star's Beads in Vienna, Virginia. The first, my Froth and Glitz Necklace and the second was Wireworked Bangle. 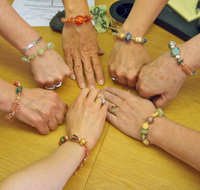 Here is a pictorial (mostly of the fiber necklace class) with the last two showing the students wearing their Bangles (was too busy demonstrating to take pics in that class!). Everyone finished their projects and were extremely happy. One person made me so happy when she said it was the best class she had ever had and the first piece of jewelry she made in a class that she would wear!